Albanian-American violinist Brunilda Myftaraj has drawn enthusiastic accolades from audiences as well as critical acclaim for her masterful musicianship in Albania, Italy, Greece, France, Morocco, Austria, Switzerland, Poland and in the United States. She has been praised by the New London Day critic as an “especially fine and beautiful player”. 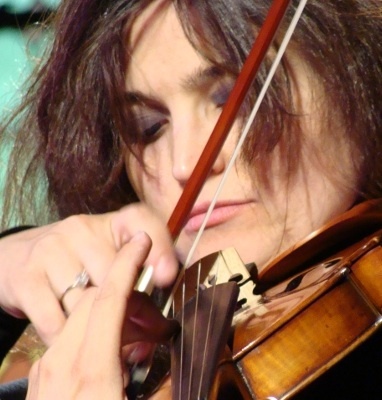 In the United States Brunilda Myftaraj has performed as soloist with the Hartford Symphony Orchestra, Farmington Valley Orchestra and a number of times with The Connecticut Virtuosi Chamber Orchestra. An avid chamber musician, Brunilda has presented recitals at the Piano and Friends Chamber Music series in Tucson Arizona, Mostly Mozart series in Napa Valley, the Schubert Club in Minneapolis, Performers of Westchester and many more. She has been featured on radio stations in NY, CT and MA and in the Hartford Courant paper. 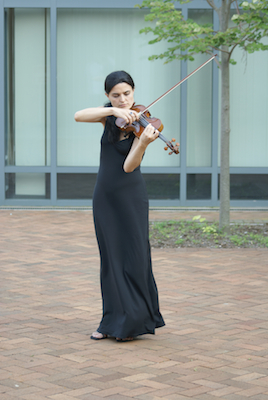 Ms. Myftaraj participated and was recognized at several competitions such as first prize winner of the Van Roy competition and the Emerson Quartet competition at the Hartt school of music in Hartford, winner of Trinity auditions in NY, semifinalist in Young Artist Guild in NY and Lipizer Competition in Gorizia, Italy as well as Indianapolis International Violin Competition in Indiana. She graduated with the Highest Honors from the renowned Conservatory of Fine Arts in Tirana. She furthered her studies in Switzerland, Italy and United States. Her teachers have included Proletare Skenderi, Piero Faulli of the Quartetto Italiano, Alberto Lissy, Phil Setzer, Eugene Drucker, Rafael Druian and Renato Bonacini. Ms. Myftaraj currently holds the position of Concertmaster for the Connecticut Virtuosi Chamber Orchestra and the Connecticut Lyric Opera. She is the director of the Virtuosi Music Academy and the Summer Music Institute in Farmington, Connecticut, where she also teaches violin and chamber music.